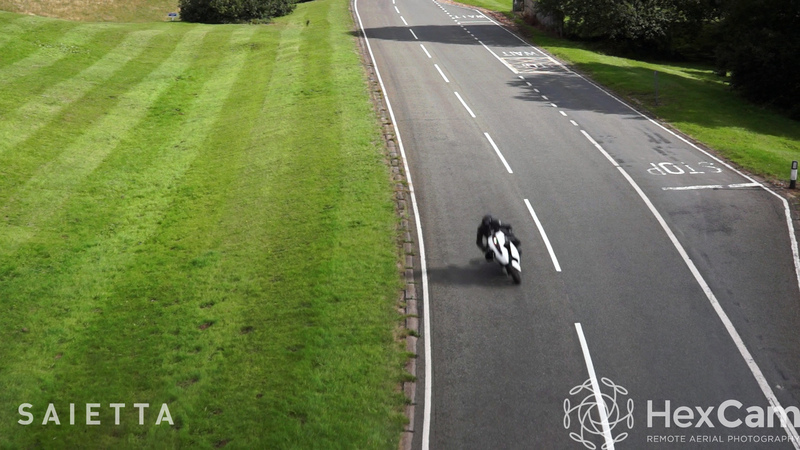 We got an email a couple of weeks ago; would we like to go and get involved in a project to help produce promotional video for a new electric motorbike? Slightly sceptical, I took a look at their website. Have a look at it before you read on, but don’t be long, OK? You can look at it again later. So, did your eyebrows just do what mine did when I first saw the website and the Saietta R? How could I not get involved? 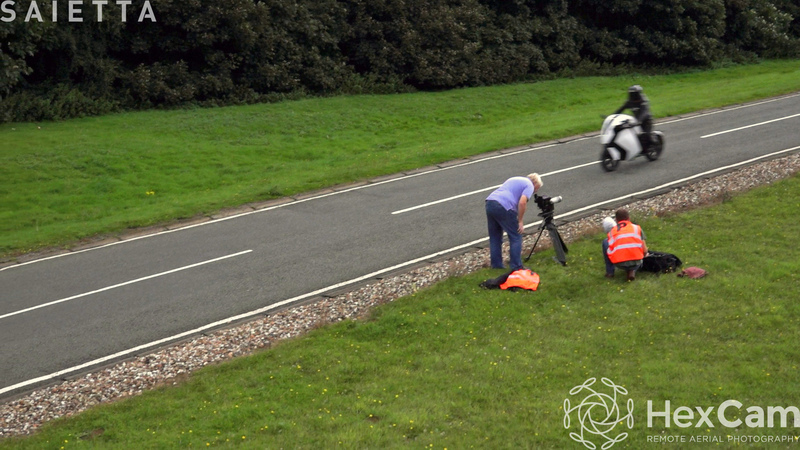 The icing on the cake was that the filming was to take place at the world famous Millbrook Proving Ground (second home to Top Gear and Fifth Gear). When the day arrived, we turned up and were passed through some pretty hefty security. Within minutes it was pretty clear why; as various cars, coated in gaffer tape and full body wraps of random patterns to make recognition difficult, were being put through their paces on different areas of the site. 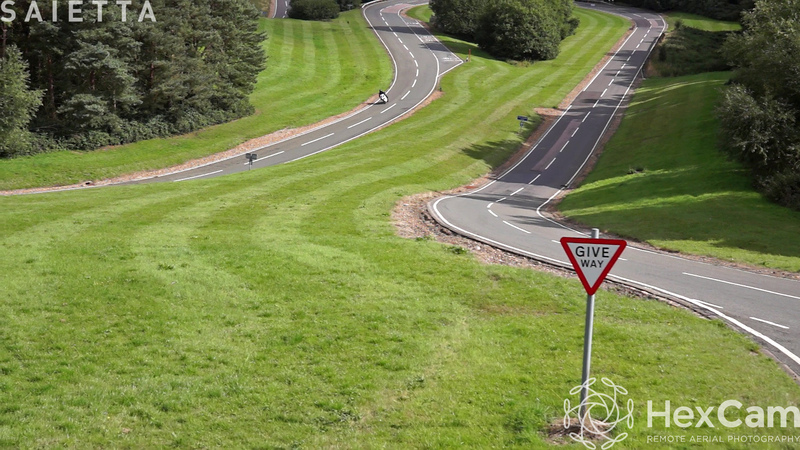 The Agility Saietta R on the Millbrook hill course. 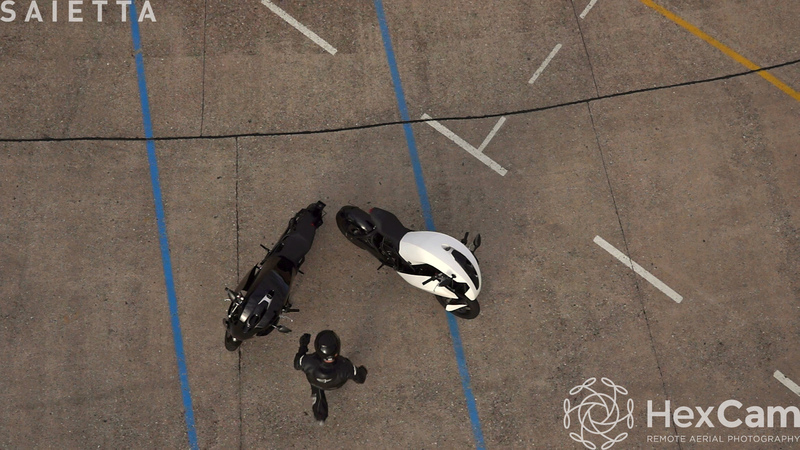 As the two Saietta R bikes were rolled off the van, it was obvious that a lot of thought had gone into both the styling and technology behind the bikes. The team, most of whom are experienced bikers themselves, obviously love the machines and were keen to get going. With the ground video team running a RED Epic we were taken around to various filming sites and we had a great day filming at different points using a range of heights and speeds as the Saietta ate up the inclines and hairpins of the hill course. 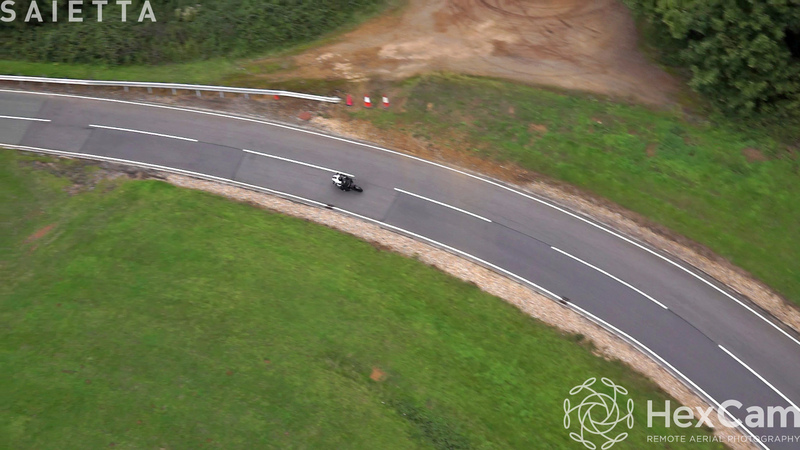 High level aerial panning video of the Saietta R coming out of a bend. 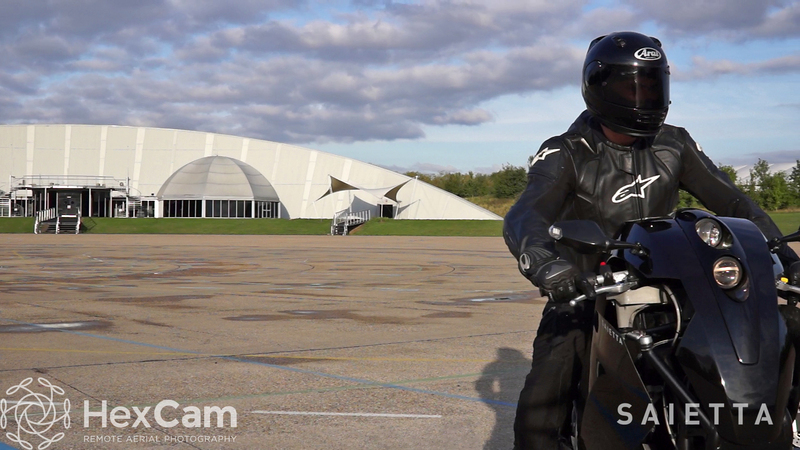 It is fairly disconcerting to see a bike move that fast – 0-60 in 3.9 seconds! 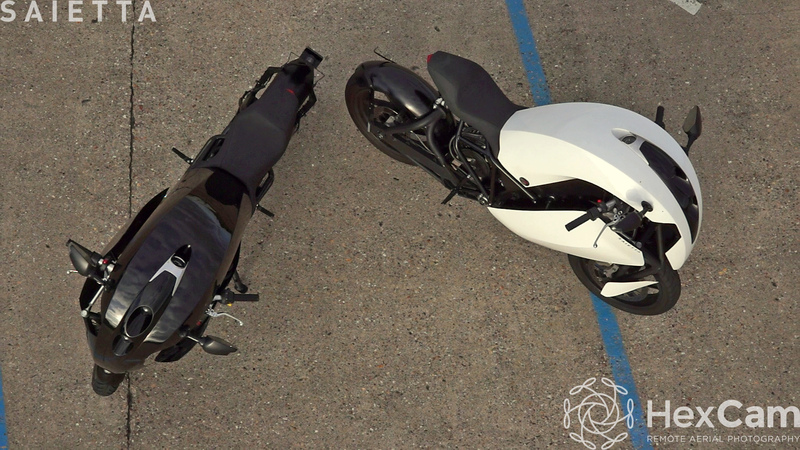 – so quietly (we generally haven’t had problems before with our copter being noisier than a vehicle we are filming), but it is clear to see that the engineering is superb. 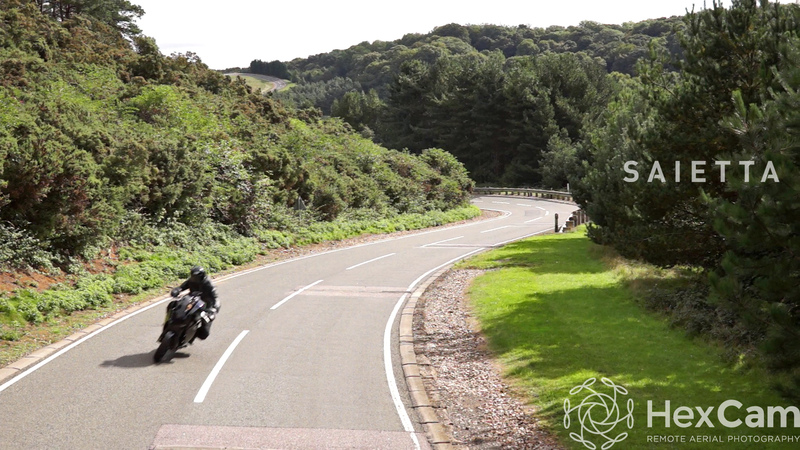 Will (our very own biker Stig) said the bike is great to ride and it seemed to handle the Millbrook hill course very well. Low level vertical aerial video of the Saietta R.
The Agility Saietta R in front of the Millbrook conference suite. Lifting aerial video of Will walking towards the Saietta R.
Tracking aerial video of the Saietta R moving through the S-bends. The ground crew filming the Saietta R on RED Epic. Tracking the Saietta R out of the hairpin.